The coyote is a wild member of the dog family. This resourceful mammal has expanded its range significantly in the recent past, colonizing the entire Northeast and now found throughout the Garden State. The coyote was never introduced or stocked in New Jersey, but has firmly established itself in our area through its extremely adaptable nature. 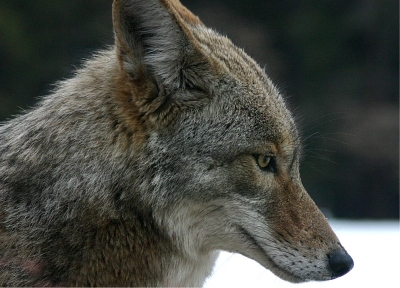 The coyote closely resembles a small German shepherd with the exception of a long snout and bushy, black-tipped tail. Another key difference from a domestic dog is readily noticeable even from a distance: The coyote has a habit of holding its tail in a horizontal position or lower while standing, walking and running. Eastern coyotes differ from their western counterparts with a larger average size and various color phases, including blonde, red and black. Recent genetic research has attributed the eastern coyote's larger size and color variations to interbreeding with Canadian gray wolves. Coyotes adjust well to their surroundings and can survive on whatever food is available. They prey on rabbits, mice, birds and other small animals, as well as young and weakened deer. They also consume carrion (decaying tissue). They are tolerant of human activities and rapidly adapt to changes in their environment. Coyotes bear litters during April and May, with females delivering between three and nine pups. Conflicts between coyotes and humans are most likely to develop as adults forage for food for the pups in the spring and summer. Coyotes primarily hunt rodents and rabbits for food, but will take advantage of whatever is available, including garbage, pet food and domestic animals that are left unattended. Allowing coyotes access to human food and garbage is irresponsible and can lead to problems. In suburban and urban areas, coyotes have occasionally attacked small pets. Although attacks on humans are extremely rare in eastern states, as with any predatory animal they can occur. Coyotes play an important role in the ecosystem, helping to keep rodent populations under control. They are by nature wary of humans. However, coyote behavior changes if given access to human food and garbage. They lose caution and fear. They may cause property damage and threaten human safety, requiring euthanasia. Relocating a problem coyote is not an option because it only moves the problem to someone else's neighborhood. In the early spring and summer, coyotes seek easy prey to keep up with the food demands of their pups. “Easy prey” may include cats and dogs in suburban areas, and young livestock (lambs, chicks) in rural areas. There may also be complaints during the fall, as young coyotes try to establish their own territories, because that can be a noisy process. But they’re fussing among themselves, and tend not to wrangle with dogs then. Coyotes in urban areas often become accustomed to humans if there is a food source in the neighborhood, and coyotes in particular look for easy meals. These clever creatures get into pet food and unsecured garbage cans. Never feed a coyote. Deliberately feeding coyotes puts pets and other residents in the neighborhood at risk. Feeding pet cats and/or feral (wild) cats outdoors can attract coyotes. The coyotes feed on the pet food and also prey upon the cats. Put garbage in tightly closed containers that cannot be tipped over. Remove sources of water, especially in dry climates. Bring pets in at night. Put away bird feeders at night to avoid attracting rodents and other coyote prey. Provide secure enclosures for rabbits, poultry, and other farm animals. Pick up fallen fruit and cover compost piles. Although extremely rare, coyotes have been known to attack humans. Parents should monitor their children, even in familiar surroundings, such as backyards. Install motion-sensitive lighting around the house. Clear brush and dense weeds from around dwellings - this reduces protective cover for coyotes and makes the area less attractive to rodents and rabbits. Coyotes, as well as other predators, are attracted to areas where rodents are concentrated like woodpiles. If coyotes are present, make sure they know they're not welcome. Make loud noises, blast a canned air siren, throw rocks, or spray them with a garden hose.